In March, I'm speaking at a women's retreat outside of Austin. Which of these seem to be a more welcoming invitation? Linking with Sandra and Deidra. I really like the first best too. They're beautiful, but the first one speaks to me...# 2 seems more like a takeaway. A blessing upon your speaking engagement. Would love to hear how it goes. I love the first one too! Yup - #1. Like the words, the font and the centering of the text. To me, the first version sounds like a warm, encouraging offer. Beautiful Pictures and timeless message! I like the first one best. Jen, I love the text at the bottom of the first. Beautiful! I be right by your side--always. First! I like both of them, but the first really grabbed my attention. One reason? I've always been exactly like that... can't walk and NOT go around the curves or up and down the hills w/o seeing what's on the other side. I've had that reputation for nearly 50 years! 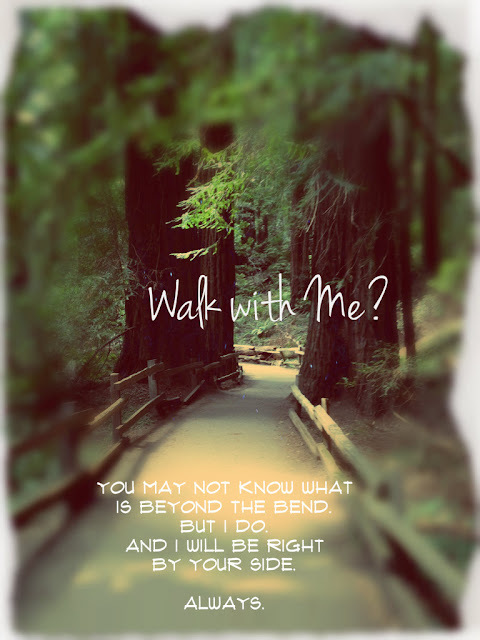 I'm also very glad the Lord takes those walks with me, and protects me, especially when I DON'T know what's around the bend, and HE does. Blessings as you make your decision and put your pieces together.